Ideal Crane is the industry leader in the design and manufacture of electric (over hydraulic) truck mounted service cranes. IC electric cranes will provide greater performance, reliability, and duty cycle. 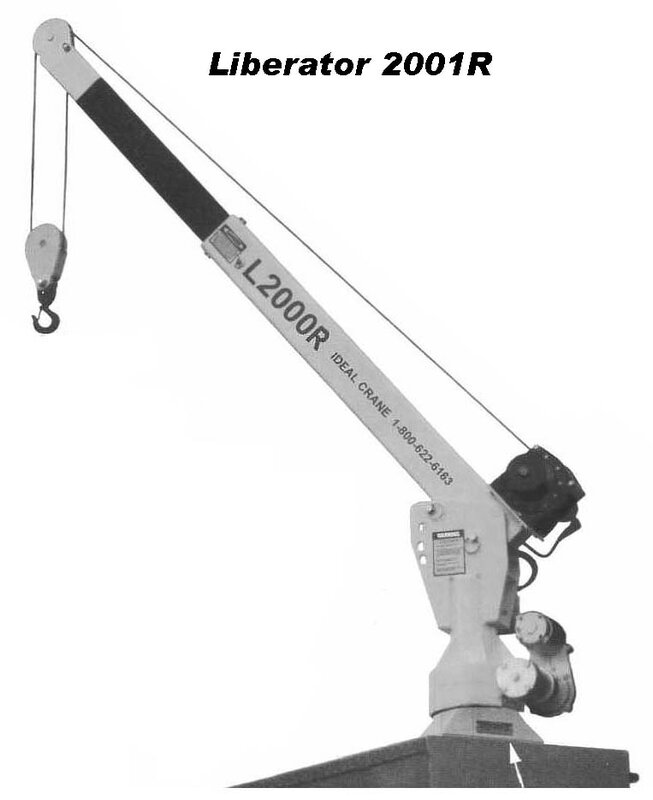 The Liberator 2001 Electric crane (shown) is designed to be installed on full-sized pickup truck chassis or higher larger. It's sleek design, compact size and urethane paint looks good mounted on your truck. It comes with 12' non-metallic remote control pendant, power cord with circuit breaker and Grade 8 mounting bolts and nuts. Efficient industrial grade planetary hoist meets ANSI diameter requirements. Polymer crane rotation bearing provides 360 degree manual rotation with friction brake. Boom telescopes manually from 4' to 6' - 6". Industrial grade electrical contactors, no automotive type solenoids. Load cushioning counterbalance valves on all cylinders for precise load handling. mounting bolts and owner’s manual. 600 amp CCA battery and 100 amp alternator recommended. Stifflegs recommended for most installations. Boom locks in 4 positions for lifting: 0o, 15o, 35o and 55o. Boom folds down when not in use on 2000R models. Smooth, 12 volt planetary hoist with low maintenance gearbox, high reliability and efficient operation. 28’ x 3/16” wire rope. 30 feet per minute hoist line speed. Industrial grade motor contactors. No automotive type solenoids. Load block with safety latch and swivel for loads over 1,200 lbs. All steel worm gear rotation drive is mounted on steel slewing ring crane bearing and provides power rotation. Powder coat finish for high gloss and durability. 16’ non metallic remote control pendant controls hoisting and rotation. Polymer wire rope pulleys are permanently lubricated to extend life and reduce wire rope wear. Mounting bolts provided (4 ea. 3/4” dia. Gr. 8). 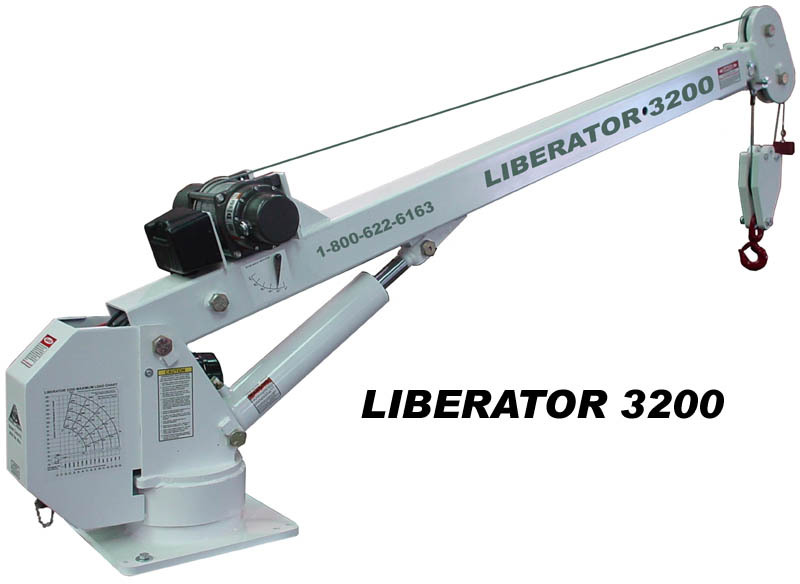 The Liberator 3200 Electro-Hydraulic crane is designed to be installed on trucks of 8,400 GVW or higher rating. It's sleek design, compact size and urethane paint looks good mounted on your truck. It comes with 25' non-metallic remote control pendant, power cord with circuit breaker and Grade 8 mounting bolts and nuts. Large diameter, self-locking, all steel worm gear rotation drive mounted on slewing ring crane bearing provides 360 degree continuous power rotation. Overload protection prevents Hoist Up, Boom Extension and Boom Down. Self-contained 12 Volt DC hydraulic system supplies 2.2 gallons per min, powered by a 1.9 hp high-output eXtended On Time series wound motor. Anti Two-Block system standard on all Power Extension cranes. Safety valves on lift cylinders prevents load drop if hose fails. 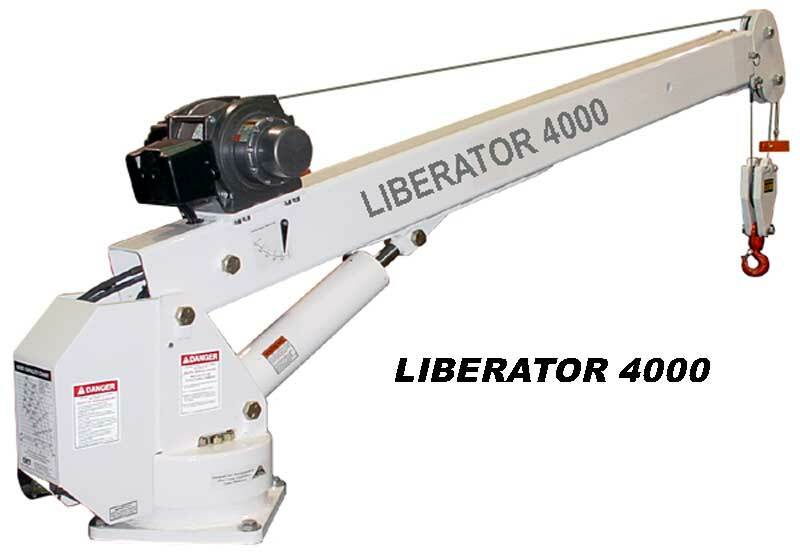 The Liberator 4000 Electro-Hydraulic crane is designed to be installed on trucks of 10,500 GVW or higher rating. It's sleek design, compact size and urethane paint looks good mounted on your truck. It comes with 25' non-metallic remote control pendant, power cord with circuit breaker and Grade 8 mounting bolts and nuts. 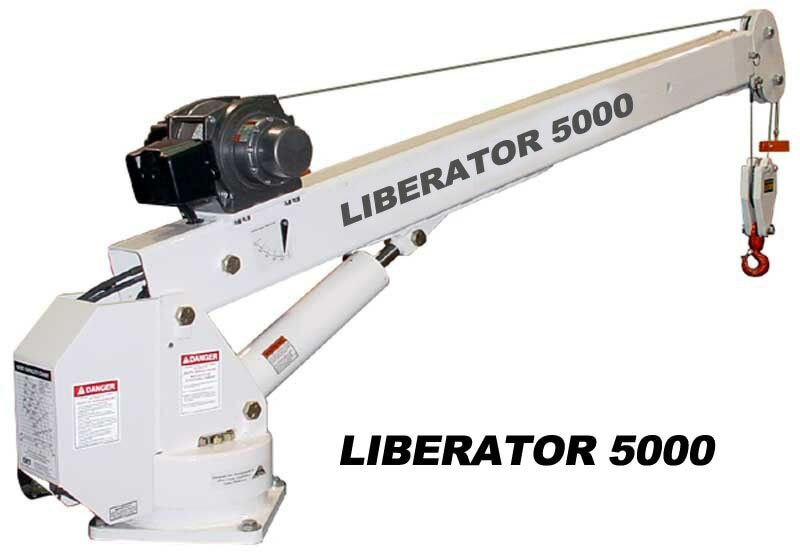 The Liberator 5000 Electro-Hydraulic crane is designed to be installed on trucks of 10,500 GVW or higher rating. It's sleek design, compact size and urethane paint looks good mounted on your truck. It comes with 25' non-metallic remote control pendant, power cord with circuit breaker and Grade 8 mounting bolts and nuts. 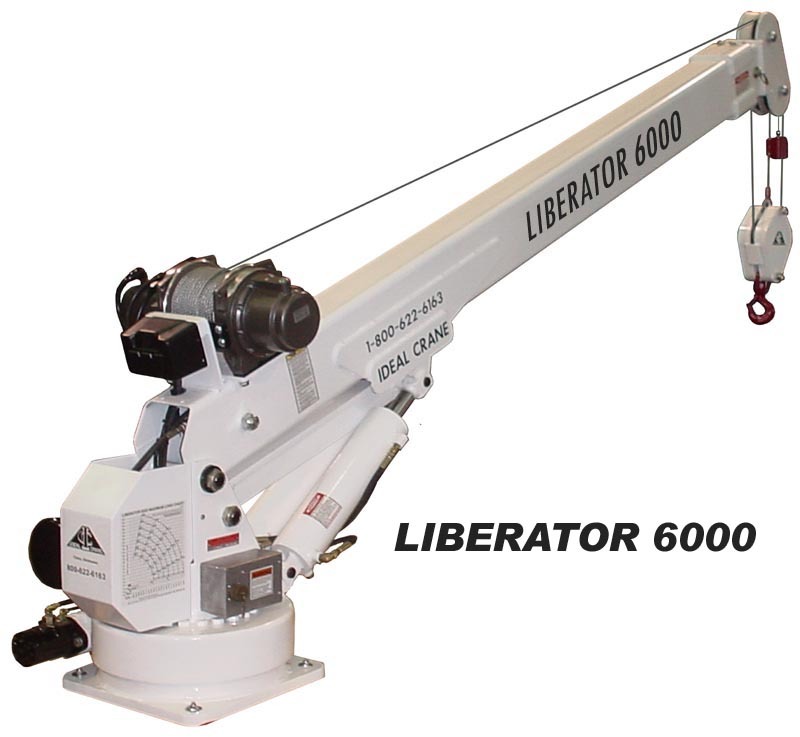 ​The Liberator 6000 Electro-Hydraulic crane is designed to be installed on trucks of 14,500 GVW or higher rating. It's sleek design, compact size and urethane paint looks good mounted on your truck. It comes with 25' non-metallic remote control pendant, power supply with all wiring harness and circuit breakers required. Grade 8 mounting bolts and nuts and included. Large diameter, self-locking, all steel worm gear rotation drive mounted on slewing ring crane bearing provides 360 degree power rotation. Self-contained Electro-Hydraulic system supplies 2.5 gallons per min, powered by a high-output eXtended On Time series wound motor. Ideal's exclusive "POWER ARM" booming technology reduces energy required to raise boom.